Fast-paced cooking competition will raise funds for Community Food! Come out on March 10, 2019 for an evening of fun, food, and fundraising, as Community Food of Community Action Center hosts the 3rd Annual Chef’s Challenge competition! 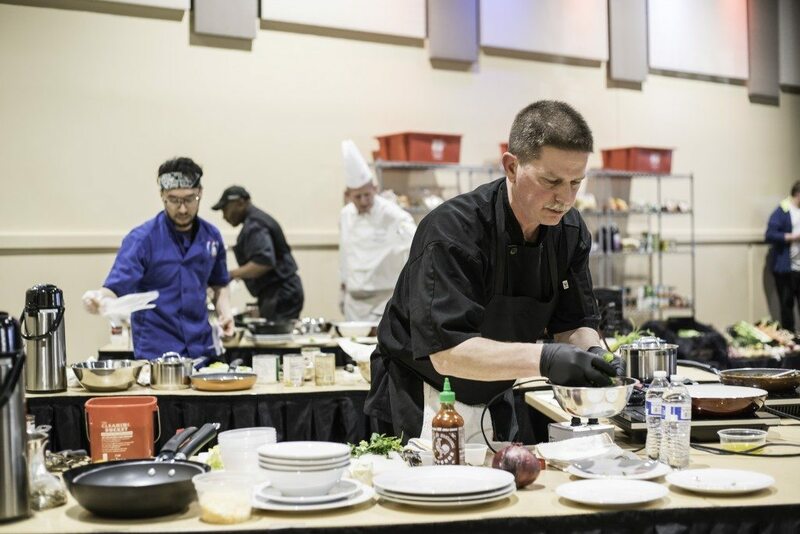 The Annual Chef’s Challenge competition features Lee Wilkins of Greek House Chefs, Scott Franke of Washington State University Dining, and one more Chef competitor to be named, who have a limited time to create a winning dish using ingredients commonly available in the Community Food Bank. Using the pre-stocked pantry that includes a mystery ingredient, the dishes will be sampled and scored by local celebrity judges: Mayor Glenn Johnson, Joan Swensen of Paradise Creek Brewery, and WSU Executive Chef Jamie Callison. Audience members can enter into a drawing to serve as a guest judge, and the winning chef will be awarded the Golden Spatula.